Muskat Studios specializes in the creation of original lithographs, relief prints, and monotypes in collaboration with regional and national artists. 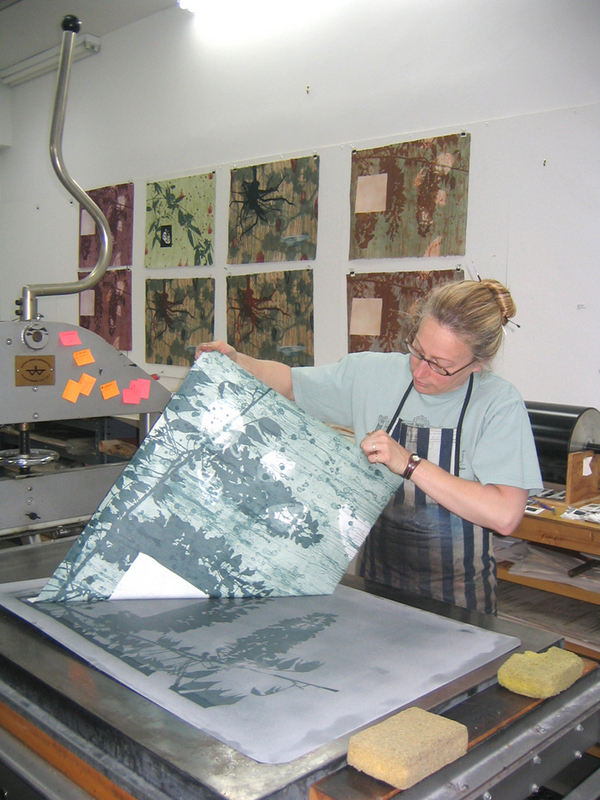 We provide a significant resource to artists looking to produce exceptional prints. 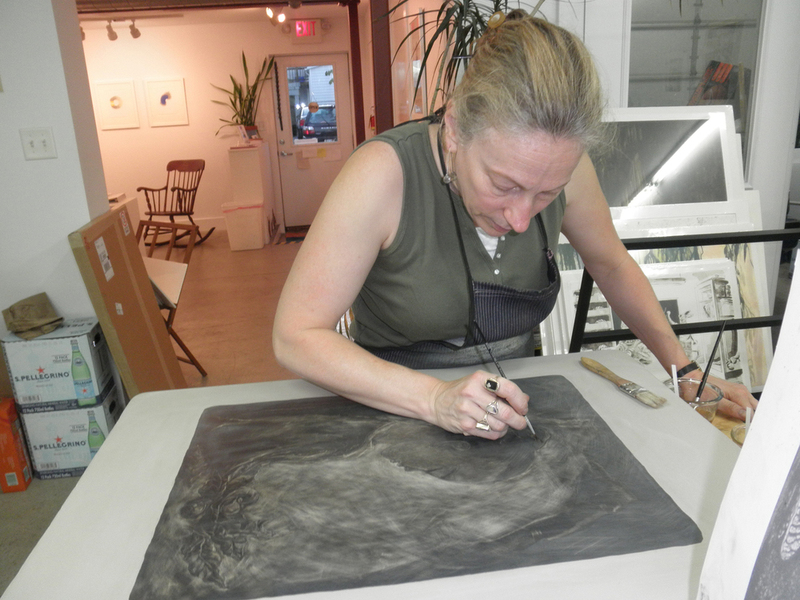 The studio offers special programming throughout the year, including artist talks, workshops, open houses and printmaking demonstrations that broaden the definition and scope of printmaking and art. The Studio is equipped with three lithographic presses – a large motorized Takach press and two Fuchs & Lang presses – allowing for print sizes up to 32 x 44″. The Studio also has a small Takach intaglio press for special projects. Materials supplied by the studio include over 60 stones, aluminum plates, photo-litho plates, polyester plates, paper, drawing materials and inks. 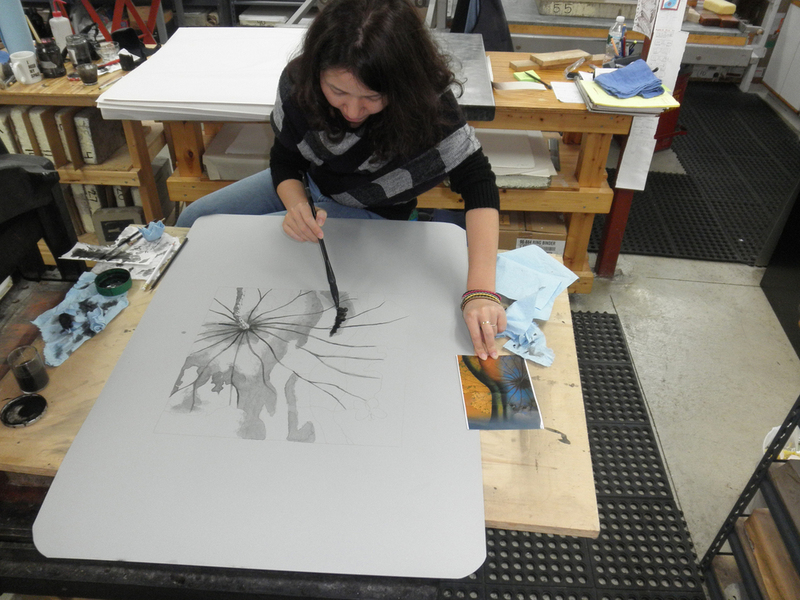 Master Printer Carolyn Muskat works closely with the artists, providing technical expertise and support for the work. Projects have included original print editions, monotype series, mixed media prints, artists’ books and installation pieces. Whether the artist is looking for a formal edition or simply exploring the possibilities within lithography, the Studio and staff are committed to producing original work of the highest quality. Artist Cynthia Maurice working at press.